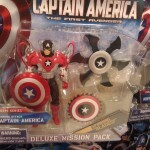 A new deluxe Captain America figure has been found(Spinning Attack Captain America). This figure features a US Agent-esque paint scheme, and bladed shields. This figure is labeled as part of the Concept Series. Discuss on the Toyark Forums› Views: 3538 › Credit: Shin Densetsu of the Toyark Forums! I saw several of these at Target several days ago... and thought nothing of it. I didn't realize it was new. This figure is freaking retarded. Anyway. I wonder what the fig looks like under the armor. It doesn't look like USAgent so much as a Cap painted black instead of blue. That would be cool. i've been wondering how i could use the armor for. need custom ideas. Captain America Deluxe Figure Series 03 - Assault Shield Captain America. That's what i was thinking- I was considering useing it for some super SHIELD or AIM thing but it's rubber and paint never sticks to ribber wother a damn. This is the only figure from the new wave that I've seen that's already peg warming for weeks now. Pretty much junk. I saw this guy last week and thought nothing of it either, ah well. Welcome to the site Glad to see you made it. I think this figure actually looks kind of cool. Like I said earlier it's interesting. I will definitely pick it up, when I see it. I like the Concept Series, we could truly get some interesting and unique figures that way. Same here except at TRU. I bought 2. What I like is that it comes with three shields, the normal one, the bladed one and a round one with small spikes on the circumference. You are 100% correct. And the armor comes off very easily. These have been out for over a week. It's definately a great looking figure, but the lack of ankle joints kill it for me as do all the other deluxe figs. well thats a wrap on Cap. By all accounts, that is the final figure from the line. 16 regular figures (plus 2 hydra soldiers and Red Skull variants) and 6 Deluxe. If I were to grade this line overall? With MU being and A+, Iron Man being a A-, Thor being a D, I'd say Cap is C+, B-? I think I'd give the cap line a solid B. I'm actually quite glad that it's a smaller line (easier on the wallet). We got some great new characters (Red Skull, Crossbones, US Agent, etc. ), some decent army builders (including comic versions of them), better versions of some existing characters (Bucky Cap FTW), pretty good accessories for the figures, and distribution has been fairly decent on the line. Down sides to the line would be the usual glut of re-paints, some minor scale issues, and a few figures here and there didn't have the best articulation (not a big deal in my mind). Vehicles kind of sucked compared to the potential that was there. I wasn't a completest with this line, but I picked up most of the figures and have been pretty happy with them on the whole. Iron Man 2 - C, some very cool figures mixed in (Mandarin, Drones, comic whiplash, War Machine) with too many bad paint apps and too many damn silly iron man's. Captain America - B-, overall solid line and much better than I thought it'd be. Hydra soldiers are cool and it was good to see US Agent, Red Guardian, and different versions of Captain Britain. 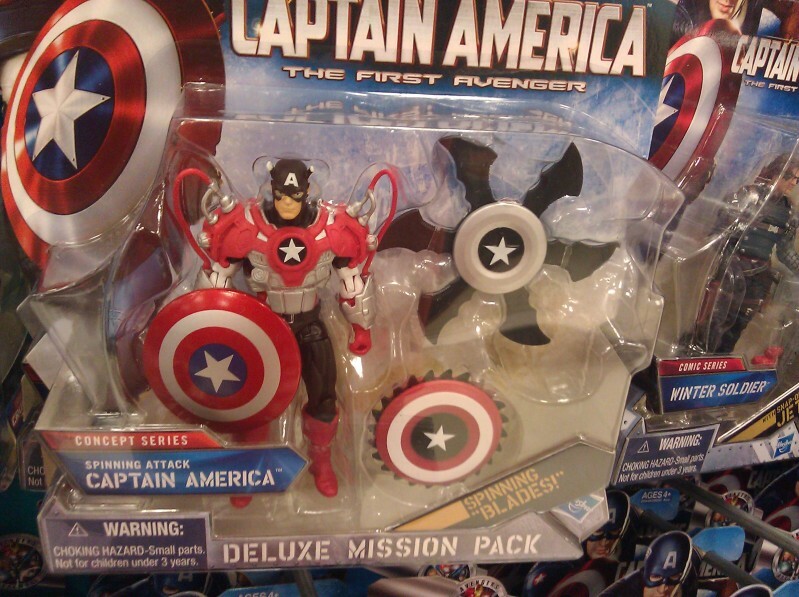 Most of the Cap figures were crap in this line and only the supporting cast really make this entire toy line.